Use an Octo-Tag to prevent accidental start-up of a machinery by a worker. • Durable, plastic Octo-Tag is receptive to pen or mark to include details like name, date etc. 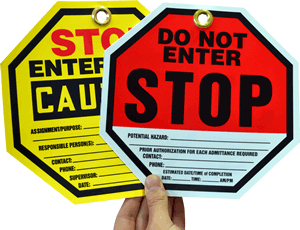 • Resemblance to a STOP sign prompts a quick response to the message on tag. 15 mil, thick rigid plastic. Includes 3/8" hole with reinforced metal grommet. Flexible, durable, and UV-stabilized to prevent aging and fading. Writable matte surface - use pen or marker. 10 mil thick, pulp-free synthetic plastic. Matte surface won't scuff. Write on with pen or pencil. For indoor and limited outdoor use.